Fundamental analysis of a stock, by close scrutiny of all financial statements, including the cash flows as well as, the future performance forecast, is an essential strategy for calculating intrinsic value of a stock. However, in a global business environment why most organizations have expanded beyond national borders, other qualitative factors which operate within the organization as well as external factors, have a major impact on the profitability and growth of the organization. 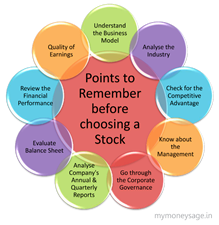 Stock prices are, therefore, not immune to these factors making it essential for any stock investor, to carefully analyze important factors such as, the organizational leadership, the management strategies, the competitive advantage within the sector, the organizational structure, the business model which has been adopted and the vision. It is very essential for any stock investor to understand the stock company, so as to minimize associated risk through analysis of the organization from every possible angle. The financial statements of any organization are a clear indicator of the profitability of the organization, as well as an indication of the mode of utilization of profits. However, it is also very important to verify whether the management of an organization is operating optimally at every level, capable of meeting organizational goals and guiding a company through a crisis situation. An organization may be performing well simply because the product they are marketing, and the quality being produced is exceptional and in demand. If the management of such an organization is not effective competitors will emerge, greatly impacting the profitability of the organization, even causing it to shut down. 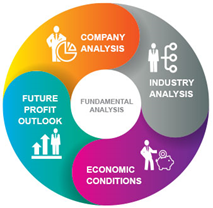 Therefore, it is essential that underlying factors for the performance of a company be analyzed, for picking a stock, to ensure that the organizational foundation is strong. For every stock in focus, the business model which is adopted should be suitable to ensure that the business can sustain in the long run and face competition. For established companies also the role of leadership needs to be analyzed, and for new companies the strategy, the goals and effectiveness of the organization strategy as a whole. 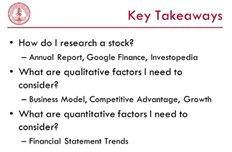 The entire concept, of qualitative analysis of stocks, is based on the simple reasoning of not only analyzing how much money a company is making but to also understand how it is making this money. The dotcom bubble which burst in the late 90s is a great example of what ignorance, while picking stocks can lead to. It was a classic example of herd mentality in stock picking, stock demand and stock purchase. Every stock investor is so keen to get a piece of the pie, they forget to reason. Most investors were unaware of the business model or the type of work involved in these IT companies. The entire excessive demand was based on the potential for growth that these companies seemed to exhibit, or were projected to accomplish, le ading to extensive euphoria with unprecedented buying of these stocks. The stocks, as was expected had to undergo correction, resulting in an extreme crash, taking the stock price closer to the real value of the stock. The king of the stock markets, Warren Buffett, did not get impressed by this stock trend staying completely away from it, in spite of criticism, as he did not understand how these companies operated. He insisted on going with his lifelong formula for stock investment, of never picking a stock which he did not know. Every organization is as good as its leader. This maxim holds true especially in a global economy, where we witness exemplary leadership making all the difference to the success or failure of an organization. Knowing an organization, can be sy nonyms with knowing the management, since the management team is responsible for mapping the goals along with the strategy to be employed to achieve them, as well as, the implementation of the plan based on the strategy. Analysis of the top management through employing the five w’s of who, what, where, when and why can provide all details required, regarding the suitability and efficacy of the management. The annual reports released by every company listed on the stock exchange provides a synopsis of the management, discussion and analysis section. This report also provides excellent information on the ability of the management, as well as its action and reaction time. It also provides a clear picture of the goals of the organization and whether the management is guiding the organization towards these goals in the perfect manner. Management should also and stability and too much management restructuring can be an indicator, of a deeper problem with the shareholders and board of directors of the company, being unable to build a consensual working relationship with the top management. The stock price is a great indicator of the performance of a company in comparison to its competitors. A company should have a clear competitive advantage over other organizations in the sector for the stock to be able to gain value and sustain in the long run. The stock should be offering value for money, converting to maximum output with minimum input for the given level. Maximization of resource utilization is a major factor which contributes to an organization having the ability to provide excellent quality goods at minimum cost. Stocks of well-managed companies with an excellent product will always be able to maintain an edge over their competitors in the long run. The sector is also important, as stocks belonging to certain sectors exhibit greater growth, as the sector the stock belongs to is presently in high demand. So it is important to be aware of external dynamics operating within an economy, which impact an organization and its stock price. The sector which a company is operating in has major impact on the stock price as even a penny stock of a small company in a growing industry has the capacity to generate excellent returns, in contrast to the stock of a large company in an industry facing a slowdown in demand. Another important factor which may seem insignificant is existence of entry barriers in various segments. Certain stocks belong to segments seriously regulated by government policies, hence making it difficult for all and sundry, to make an entry into the industry. An entry into some industries such as Pharmaceutical or Power have extensive government regulations, patents, with large capital investment requirements serving as entry barriers. The stocks of these companies make a better investm ent option, as competition is minimized through the restrictions imposed on entry into these sectors. The brand name associated with the stock of a company or a product is another major factor impacting stock price and valuation of a company. The value of a stock is as good as the value of the company, therefore stocks of brands which have gained popularity and proved themselves, provide an intrinsic value to the company which can be worth more than the assets of the company. The brand becoming bigger than the company is a phenomenon which we have witnessed with brands such as Coca Cola, Johnson and Johnson, Hershey and Cadbury to name a few. The stock prices of these brands can be very sensitive to news, any related news can cause the stock price to rise or drop substantially, depending on the news being positive or negative. Many intelligent stock investors stay away from companies which are built around a single individual, for the same reason, as they stay away from brands. Any negative news in the media can cause the stock price of such companies to crash without providing opportunity to a stockholder to dispose of such stock. For a stock investor to pick the right stock, it is not always necessary that the gem of a stock will be revealed on extensive fundamental analysis whether qualitative or quantitative. Exceptional stocks mostly neighborhood stories or innovative business ideas waiting to explode resulting in creation of vast businesses. An average person can identify an exceptionally innovative business idea which looks like it can obtain exceptional success, investigate further into the business model and strategy, and make an investment if appropriate. These are the stock picks which are the basis of most stock market dream investments. Every investor enters the stock market with the hope of finding this one stock, which will make all dreams of exceptional returns from stock investment, come true. 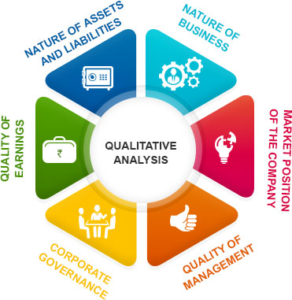 Qualitative analysis requires an individual to be in intimate contact with the smallest information of an organization, resulting in absolute understanding of the dynamics at play internally and externally impacting the stock price, as also the expected future performance of the stock on this basis, Our expert qualitative analysts have their finger on the pulse of the economic world, staying abreast of all major economic events within the external environment and every minor event internally, within the organization of the stock in focus. At Beat any investment, our experts at any given time, have complete information of all qualitative dynamics impacting the stock in focus, to ensure we invest in the very best stock for you, every time. Our experts are prepared to guide you through the stock market jungle, ensuring you get out safe, secure and enriched. Just fill in your details, leave the rest to us.